An SGC probe crashes into a large plant on PJ2-445. 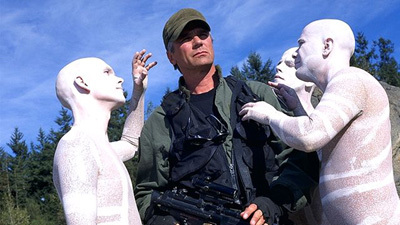 When SG-1 goes to retrieve it, they meet the planet's inhabitants, gentle, curious, and simple beings, human in form, and silent except for an entrancing song. Shortly after the team's arrival, however, the aliens begin falling ill, and soon a global plague is threatened. Even SG-1 begins to feel ill, but the cause remains a mystery until a video recording reveals the presence of inaudible sound waves. These sounds, produced by the plant life, are necessary for the aliens' survival, and SG-1 must restore the symbiotic balance they unwittingly upset. Long term exposure to certain sounds can cause serious physical side effects including headaches, nausea, and severe irritability. The plants naturally emit an inaudible sound that the aliens need to live. The injured plant emitted a low-pitched sound that prevented the aliens from getting the sound they need, and had negative effects on SG-1. The humaniod aliens have a symbiotic relationship with the plant-like organisms of the planet. They communicate with them through a unique trilling song. Witness if you will... squat.